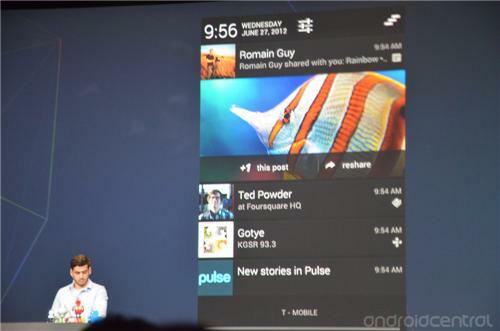 Notifications are just one of the areas of the new Android 4.1 Jelly Bean UI that are getting a makeover. Buttons for callback are included now within the notification drawer when a missed call shows up. Pretty neat. That's only the beginning though. Notifications are now expandable. Essentially, it's like putting widgets into the notification bar. They auto expand and collapse, and there is a lot of emphasis on functionality outside of the related applications. Google+ notifications can show up the pictures within the notification tray itself, for example. Another example showed up the Pulse news app notifications. Currently we just get a boring old message telling us there are new stories. In Jelly Bean, it's pretty much as though the application itself is sat in the notification bar. Slick. Notifications just got a whole lot more interesting.